Philosopher and theologian, St. Thomas Aquinas was born around 1225 in Roccasecca, Italy. Combining the theological principles of faith with the philosophical principles of reason, he ranked among the most influential thinkers of medieval Scholasticism. He was an authority of the Roman Catholic Church and a prolific writer. Thomas had eight siblings and was the youngest child. His mother, Theodora, was countess of Teano. Following the tradition of the period, St. Thomas Aquinas was sent to the Abbey of Monte Cassino to train among Benedictine monks when he was just 5 years old. St. Thomas Aquinas remained at the monastery until he was 13 years old, when the political climate forced him to return to Naples. St. Thomas Aquinas spent the next five years completing his primary education at a Benedictine house in Naples. In 1239, St. Thomas Aquinas began attending the University of Naples. And In 1243, he secretly joined an order of Dominican monks, receiving the habit in 1244. When his family found out, they felt so betrayed that he had turned his back on the principles to which they subscribed that they decided to kidnap him. Thomas's family held him captive for an entire year, imprisoned in the fortress of San Giovanni at Rocca Secca. From 1245 to 1252, St. Thomas Aquinas continued to pursue his studies with the Dominicans in Naples, Paris and Cologne. He was ordained in Cologne, Germany, in 1250, and went on to teach theology at the University of Paris. After completing his education, St. Thomas Aquinas devoted himself to a life of traveling, writing, teaching, public speaking and preaching. He was referred to as "The Christian Apostle." St. Thomas Aquinas believed in the laws of the state and social welfare, which he felt would help to accomplish man’s spiritual goals. Being a prolific writer, St. Thomas Aquinas penned close to 60 known works ranging in length from short to tome-like. Handwritten copies of his works were distributed to libraries across Europe. His philosophical and theological writings spanned a wide spectrum of topics, including commentaries on the Bible and discussions of Aristotle's writings on natural philosophy. Shortly after his death, St. Thomas Aquinas's theological and philosophical writings rose to great public acclaim and reinforced a strong following among the Dominicans. Universities, seminaries and colleges came to replace Lombard's Four Books of Sentences with Summa Theologica as the leading theology textbook. The influence of St. Thomas Aquinas's writing has been so great, in fact, that an estimated 6,000 commentaries on his work exist to date. 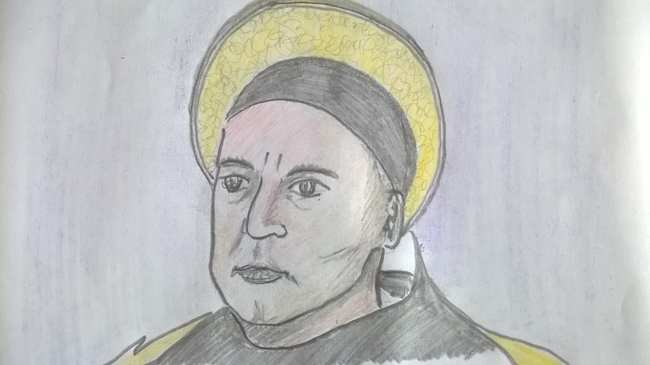 In June 1272, St. Thomas Aquinas agreed to go to Naples and during the Feast of St. Nicolas in 1273, St. Thomas Aquinas had a mystical vision that made writing seem unimportant to him. At mass, he reportedly heard a voice coming from a crucifix that said, "Thou hast written well of me, Thomas; what reward wilt thou have?" to which St. Thomas Aquinas replied, "None other than thyself, Lord." In January 1274, St. Thomas Aquinas embarked on a trip to Lyon, France, but never made it there. Along the way, he fell ill at the Cistercian monastery of Fossanova, Italy. The monks wanted St. Thomas Aquinas to stay at the castle, but, sensing that his death was near, Thomas preferred to remain at the monastery, saying, "If the Lord wishes to take me away, it is better that I be found in a religious house than in the dwelling of a layperson." Often called "The Universal Teacher," St. Thomas Aquinas died at the monastery of Fossanova on March 7, 1274. He was canonized by Pope John XXII in 1323.